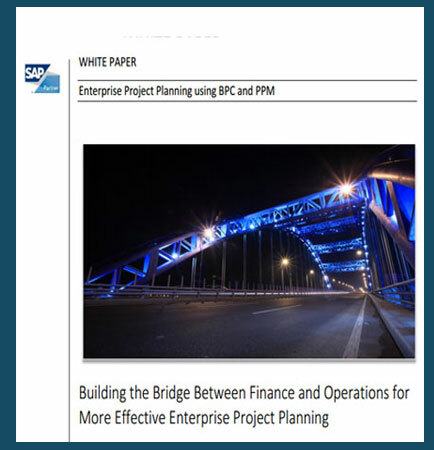 "Effective Enterprise Project Planning using SAP PPM and BPC"
Corporations across the full spectrum of industries have been planning and executing projects since their founding. Across the passage of time methodologies and processes mature, tools are introduced and enhanced, knowledge is acquired and shared, practices (both good and bad) become ingrained into the corporate culture. For many of these businesses anything greater than a minor change to the status quo presents a major challenge, especially if the change is not sponsored by Senior Management and the benefits are not readily identifiable and quantifiable by those impacted. If the architects of change fail to address the critical question that is asked or implied by all interested parties and stakeholders, “What’s in it for me?” the initiative, whatever it is, will be at severe risk of failure. How to Choose an ERP System? Selecting, installing and implementing a new ERP System may be the toughest business challenge you face because the results of the process are so critical to your business. There are many common methods people use when trying to select the ERP software. Some of them work well, others don’t. This whitepaper discusses some of these techniques based on what your priorities are in selecting an ERP software to solve challenges and exploit opportunities. How to evaluate an ERP system? Selection Criteria for Choosing an ERP Software In order to select the very best ERP system to meet the unique requirements of your company, you need to evaluate the ERP service providers with respect to certain criteria like: Level of Support from the Solution Provider. Vendor’s Track Record of Performance. Software’s Ability to Fit the Business. Growth Potential of the Software. Price of the Software. Quality of Documentation. Download this whitepaper for a closer look at the steps involved in evaluating and selecting the right ERP system for implementing automated business management system that can meet the unique requirements in your organization. What is ERP System ? Enterprise resource planning (ERP) system is an IT system, specifically a business process management software that allows organizations to use a system of integrated applications to manage the business and automate many back office functions related to technology, financials, materials planning and human resources.